As the name suggests the "Interstation" Bus was used for transferring passengers between London railway termini. They were built for London Transport in 1936 and operated until 1939 and then between 1945 and 1950. The "Interstation" service was mainly operated at night. 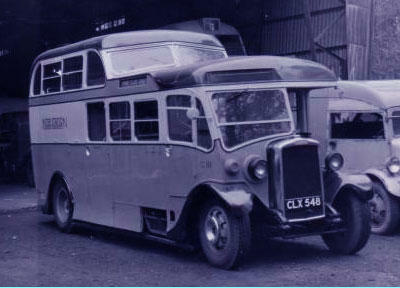 The bus was a Leyland Cub, a vehicle used by LT on many of its less trafficked London country routes. 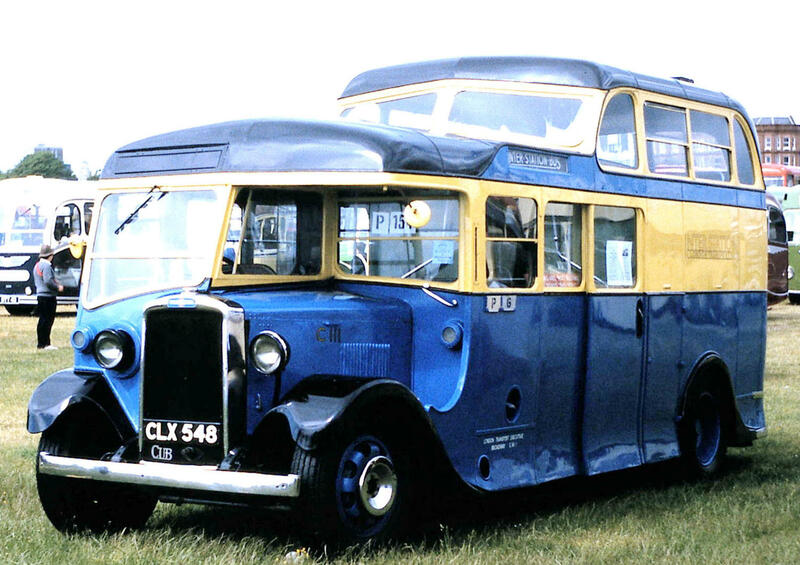 The special "Interstation" bodies were built by Park Royal and were finished in eye- catching primrose and powder blue livery with black roofs, only eight of these unusual buses were built. 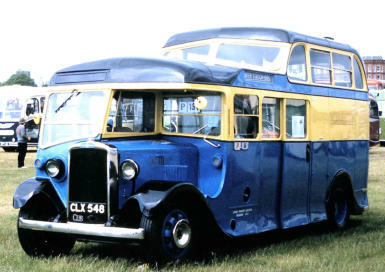 Twenty passengers could be carried with seating for eight on the lower deck and twelve on the upper above the large luggage hold, accessible from double doors at the rear and side doors. 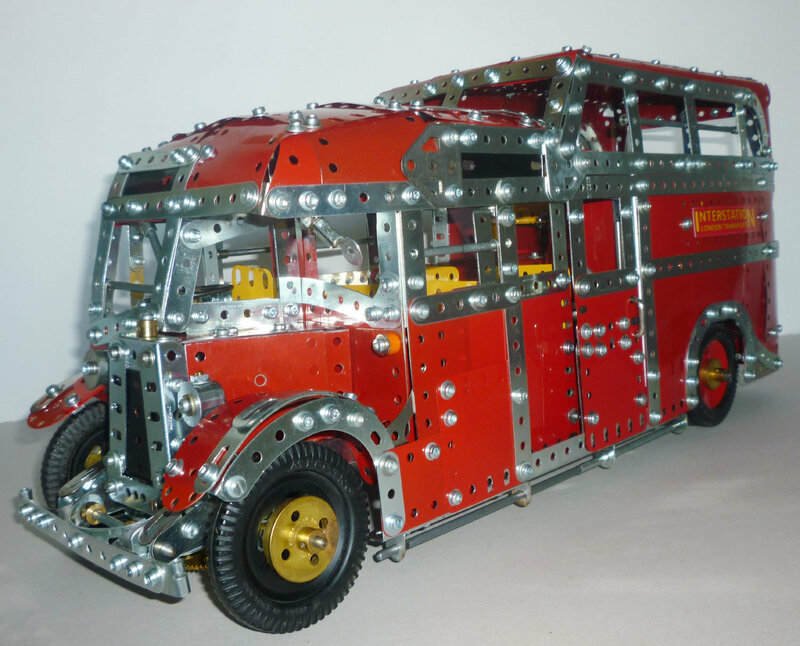 The model was originally designed and built by the well known Meccanoman Geoff Wright who built it from the contents of a late nineteen fifties number 9 outfit. 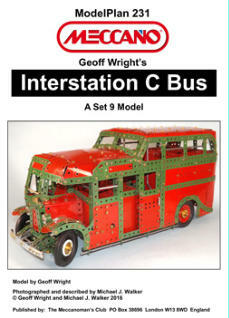 In this model Geoff Wright demonstrates what a very detailed and realistic model can be built within the contents of the number 9 outfit. In 2016 Michael J. Walker photographed and described its construction for ModelPlan 231 (published by MW Models) these were the plans I used to construct my model. 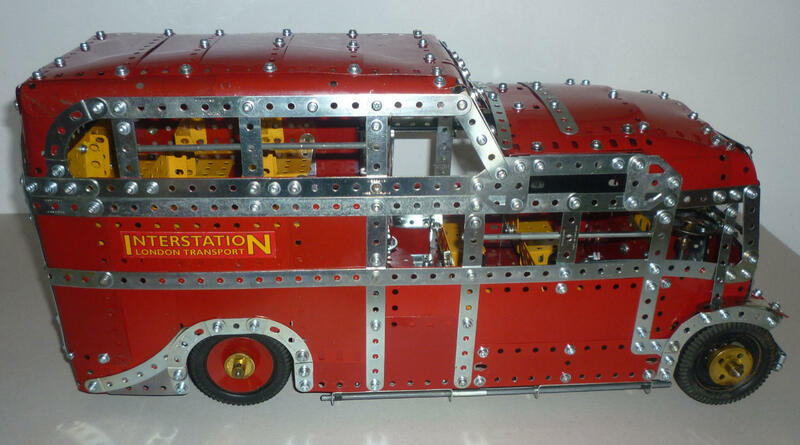 The plans do not include a list of the parts required which I guess would be fine if building it out of the box of the number 9 set. However from the outset I decided I would not restrict my model to the contents of the number 9 outfit without changing the model fundamentally. The seats as specified are made from 5x5 hole flexible plates sharply folded, as I have a large quantity of yellow 5x3 flanged plates so I made each seat from two of these. A nice feature of the model is the neat sliding passenger door on the near side of the bus the model also has steering, leaf spring suspension, opening rear doors and interior features. 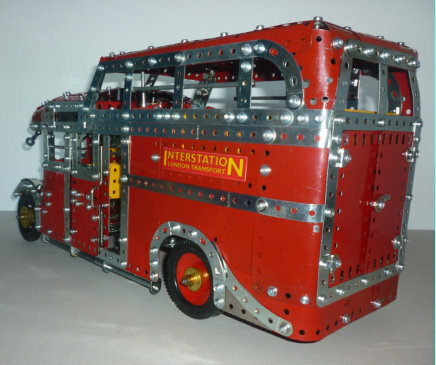 My own version was built using mid fifties red plates and zinc parts the red I think gives a good impression of how the bus might have looked in standard LT livery. 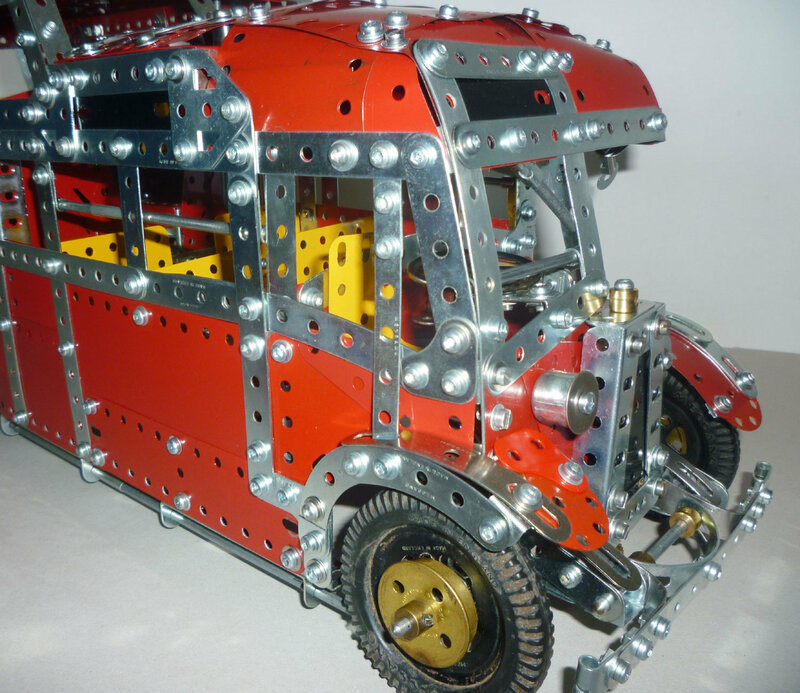 A FEW USEFUL BUILDING TIPS I found the model a challenging build, particularly the construction of the front suspension and forming the curved roof sections which I found best done before adding to the body section. 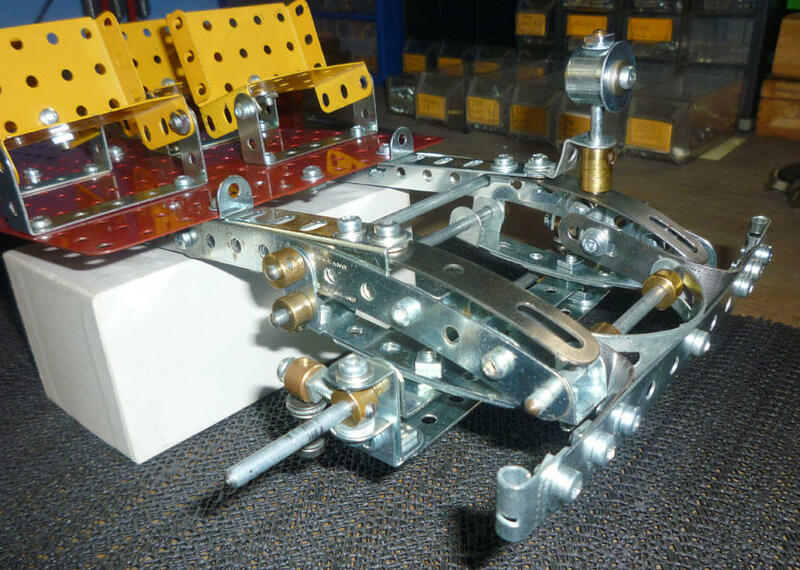 I would recommend the use of a plate roller, two drifts P/N 36c and some short rods with bosses attached to aid in the alignment of the flexible plates before securing these parts. I would NOT recommend the use of plastic plates, these look a good idea but the sections need to be pre-formed to their approximate shape something that cannot be done with plastic, they are also prone to split ! 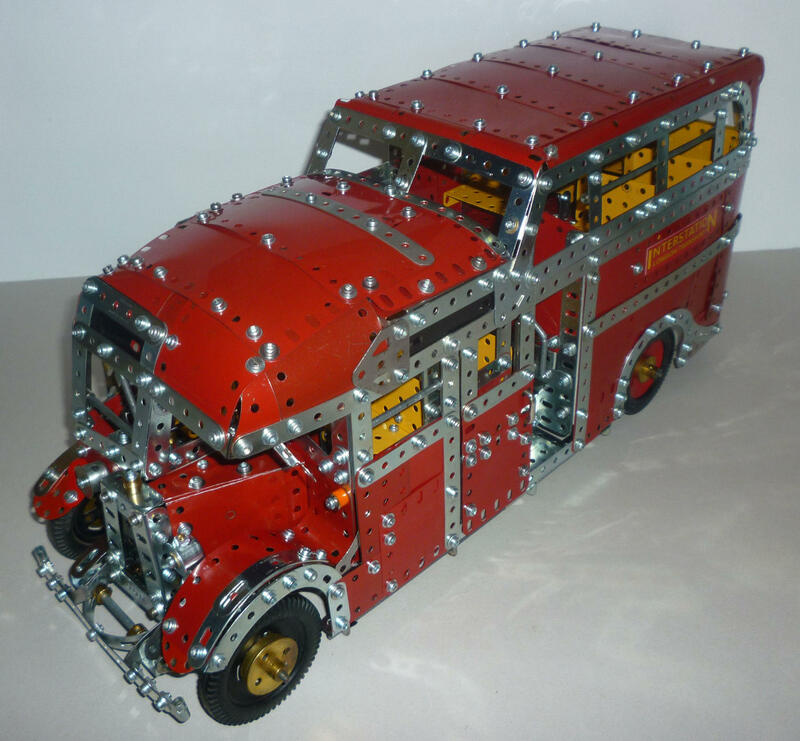 I used many more nuts and bolts than in the number 9 outfit. I found slightly longer bolts were very useful in some places for pulling the plates together. Thin M4 washers are a must to use on the plates particularly the slotted type.